SportMaster is a globally recognized leading manufacturer of tennis court resurfacing products, tennis court paint, and tennis court crack filling and repair products. Our 100% acrylic tennis court color coatings produce highly attractive, durable surfaces with player-friendly spin responsive play. 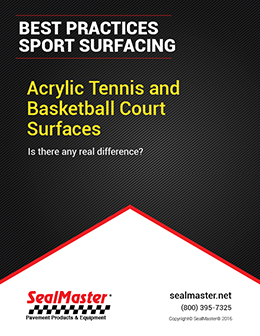 SportMaster also produces premium quality basketball paint and coatings, pickleball paint and coatings, and running track surfaces and repair products. Detailed product information including descriptions, coverage rates, etc. Information and tools for Architects & Specifiers: CSI, 3-part guide specifications for court resurfacing, tennis court resurfacing cost, tennis court maintenance manual, LEED credit information page for SportMaster systems. 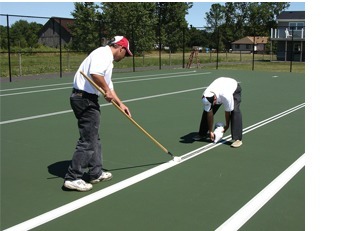 “Locate Installer” page for sending us a request to refer a qualified tennis court builder or resurfacing contractor. Schedule Your FREE Tennis Court Inspection and Estimate for Resurfacing and Repair. Our nationwide network of highly trained and experienced tennis court surfacing professionals are available to provide on-site project recommendations as well as full application services to assure quality results at competitive prices on every project. Simply complete and submit form below and a representative will respond to your request. Which coating should be used for a tennis court or basketball court, or can the same surface be used for multiple sports? Download this FREE white paper to learn what the experts at SportMaster have to say. No more guessing – Just the facts!